The EDL’s “Nottingham Division” has announced a demonstration in Nottingham on Saturday August 6th. This hasn’t exactly gone down well with city council leader Jon Collins who has called on the police to ban the march. The city’s Market Square is currently the site of a beach, complete with sand, water and fairground rides. A horde of drunken fascists doesn’t exactly fit with the intended ambiance. “We’re extremely concerned about the prospect of an event of this kind taking place in the heart of the city centre during the school holidays. Banning the march is unlikely to be very effective. Under the Public Order Act, it’s only possible to ban marches, not static demos. Whatever the police decide, the EDL will likely turn up anyway. That said, they aren’t likely to get many people out. 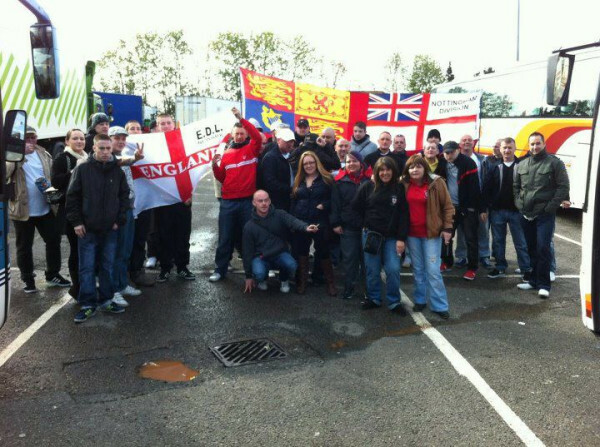 The EDL is a drink-addled shadow of the organisation that brought several hundred members to Nottingham in 2009. On Saturday they held a national demonstration in London. It wasn’t a great success, as EDL News explain: “Only 50 turned up and those that did were staggering around drunk and high on drugs.” The latest EDL split (ironically using the moniker United People of Britain) followed days later. Recent protests in Nottingham by the Notts Casuals Infidels have hardly been major victories for the far-right and suggest the the inevitable handful of drunken fascists are unlikely to be get a warm welcome.